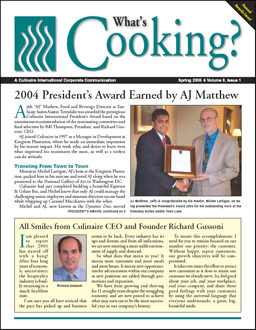 The article ideas listed here are often featured in the employee newsletters that CompanyNewsletters.com creates for its clients. This sample was produced for Culinaire International. It happens to virtually every employee newsletter editor. 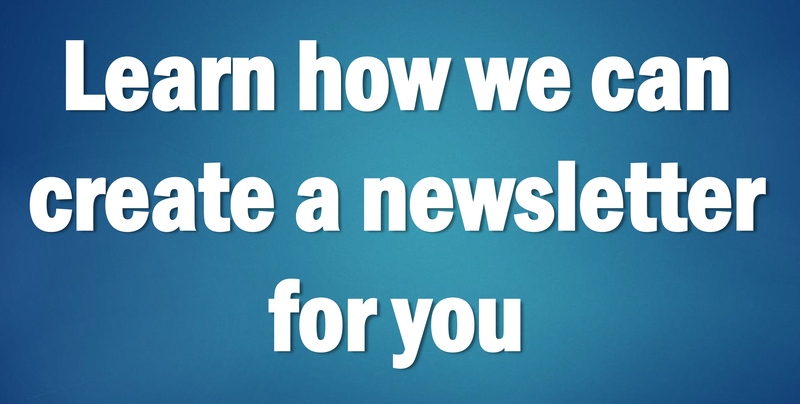 For some newsletter issues, you have more news than will fit into your newsletter. But if things have been quiet at your company in recent months, you might have the opposite dilemma: Trying to come up with enough articles to fill your newsletter. • Employee profile: Highlight the job duties and accomplishments of one of your company’s excellent employees. Explain what the person does, mention major accomplishments, quote the employee as to the challenges of his or her job, how the person strives to do a quality job, etc. This type of article not only gives well-deserved recognition to the featured employee, it also sets a positive example for other employees to follow. • Health tips and employee wellness: To reduce the number of sick days taken by employees, as well as to promote the well-being of a company’s work force, many employee newsletters feature health-related articles. For instance, educating employees about how to properly lift heavy packages will help reduce back injuries. Teaching employees how to prevent the spread of common ailments such as colds and flues can greatly reduce the number of people in the workplace who are spreading germs and getting their co-workers sick. And if your company has an employee wellness program, you could do articles about the latest fitness classes being offered onsite, a new smoking cessation program that you are offering, etc. • Safety reminders and tips: For most companies, educating employees on proper safety procedures is paramount, and a newsletter is yet another way to emphasize the importance of safety. As new equipment, machinery, raw materials and chemicals are being used in your workplace, employees need to be educated on the proper safety procedures for each. Also, federal, state and local safety regulations are constantly changing, so safety articles in your newsletter provide an excellent vehicle for keeping employees up to date on these important requirements. Also, general safety tips (for instance, the importance of wearing safety glasses, properly storing dangerous chemicals, etc.) are also excellent article topics for a newsletter and help to constantly keep safety on employees’ minds. • Department, division or branch office profile: If your company has locations throughout the state, the country or even the world, employees at one location probably know very little about what the employees at other locations do. Or even if employees work at the same location, people in customer service may have no idea what the people in “procurement” really do on a day-to-day basis. To remedy that, you can highlight a different department, division or branch office in each issue of your employee newsletter. Write about what the department, division or branch office does, who the key people are, and show photos of key employees and even the buildings that they work in. Readers love to see photos of coworkers they’ve talked to at another location, but have never seen in person. • Hot company news being discussed by the company’s executives: Many CEOs hold weekly or monthly meetings with their executive staff to discuss important company news, get updates from various divisions and departments and to address hot topics at the company. Larger companies will often record meeting notes or “minutes” and distribute them to key people throughout the company to keep management up-to-date on the topics discussed at these executive meetings. These meeting notes or minutes are often loaded with excellent article ideas for employee newsletters. After all, if executives are discussing a topic, it is probably an important topic to the company and employees should probably know about it (unless it’s a confidential matter). For instance, if the executives are discussing opening the company’s first office overseas, that is definitely worthy of an article in the employee newsletter. Or if executives are discussing an important, large, new client that decided to come on board with the company, that would also make for an excellent article. • Company goals and periodic updates: Virtually every CEO charts out the goals for his or her company at least annually. At the beginning of the year, interview your CEO and list that person’s company goals for the year. At the beginning of the year, interview your CEO and list that person’s company goals for the year. • Stock watch: If you work at a publicly held corporation, top executives are certainly keeping a close eye on the price of your company’s stock because it’s one important measuring stick of a company’s performance. However, many of your corporation’s employees probably don’t understand how shares of stock work or the importance of the company’s stock price. Many employees also don’t fully understand how the company’s performance and current economic conditions impact stock prices. That’s why it’s a great idea for employee newsletter editors to educate employees on these stock-related matters, as well as to keep readers up to date on the stock’s performance since the last newsletter issue was printed. Graphs showing the stock price over the last three months or year are also appreciated by readers. • Employee volunteerism: Many of your company’s employees are probably active volunteers in a variety of charities. Profile some of these top volunteers in your newsletter, either listing all top volunteers in one article, or profile a different volunteer in each issue of your newsletter. These types of articles give employees some positive recognition for their generous contributions of time to local charities, and thank them for representing your company well. • Employee benefits changes and deadlines: If your company is like most, your employee benefits are constantly changing. Employees love to know about their benefits, so if your company is changing health plans, for instance, an article about the new plan and how it is different than the old plan will be well read by your employees. Also, a newsletter article is a good way to remind employees about important upcoming deadlines, such as the end of open enrollment for a benefits plan, the deadline for changing investment accounts in employees’ retirement plans, etc. • How a current event affects your company: Pick any current news event, and it likely has some kind of impact on your company. Most people are interested in current events, so employees are usually very interested in reading about how a current event is impacting your company. For instance, when gas prices skyrocket, it almost always has an impact on a business and the price of its products. And the current popularity of organic foods has impacted numerous companies in industries from farming and ranching to grocery stores, restaurants, food producers and more. Ask executives at your company how relevant current events are impacting the company, and it will likely make an excellent article. • Employee accomplishments outside of work: Employees love to learn more about their coworkers, especially their lives outside of work. Maybe one of your employees has been training for the last year and recently ran her first marathon. Maybe another restores vintage fighter planes from World War II. Another employee may have lost 100 pounds after dieting for the last year. Each of these employee accomplishments would make for an excellent article topic, and it would likely be one of the most-read features in your newsletter. • Technology upgrades: Chances are very good that somewhere within your company, some department is implementing new software, automating a process or upgrading their technology in one way or another. Write an article about these technology upgrades and explain how they will improve efficiency and how the company, its employees and customers will benefit from the new technology. • Employee service anniversaries: Many companies like to recognize employees who have reached milestone service anniversaries (working for the company for five years, 10 years, etc.) by listing the employee and his or her photo, along with years of service, in the newsletter. • Employee birthdays: Many companies like to feature upcoming employee birthdays in their newsletter. Usually they list the employee’s name, title, location and birthdate (without the year, of course, so you don’t give away the person’s age). This little morale booster helps make sure no coworkers’ birthdays go unnoticed. These proven article ideas are typically very well received by both readers and company executives, and they can help you round out a newsletter that is short on content.